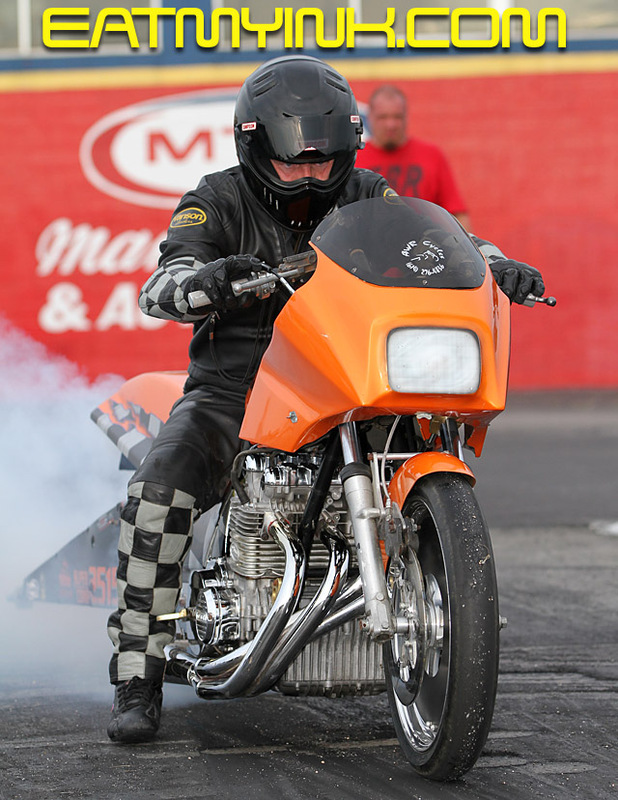 Anybody who is not a member of Orient, Ohio’s Teasley family no doubt gets tired of seeing their name in the headlines of nearly every major motorcycle drag race in the nation. 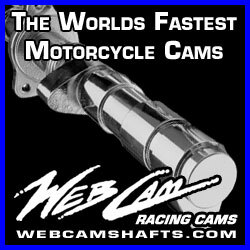 But truth is, they are at all of those races with a full trailer of motorcycles prepped for all-out assaults on checks and trophies, and walk away with more than their share. Usually it’s Jeremy taking the Teasley headline honors, and he more than held up his end this past weekend at the Dragbikelive.com Sportsman Showdown at Steve Earwood’s Rockingham Dragway in North Carolina, stop number six on the nine round Mickey Thompson MIRock Superbike Series schedule. 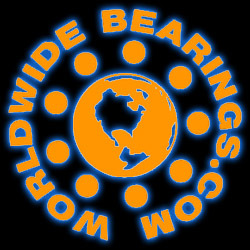 In what really was a test session for Teasley and the RS Motorsports Kawasaki ZX14 he rides in DME Real Street, Jeremy entered FBR Shop 5.60. The team fully intends to run Real Street 7.60s on the bike, and owner/tuner Roger Starrette was throwing more nitrous pills into the stacks to see what it would do. Razor-sharp leaver and finishline judge Teasley took the opportunity to collect another MIRock win along the way, beat class sponsor and points leader Marion Ford in the 5.60 final. Jeremy rode his legendary foot-shift, stock wheelbase, stock motor, no weight added, no MSD SB6-equipped, 8.60s Kawasaki ZX14R streetbike to beat August race winner Scottie Keller in the MIRock Crazy 8s final. 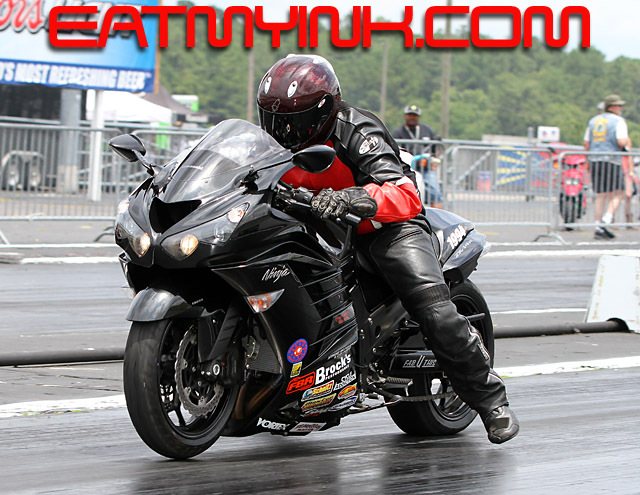 Younger brother Cameron Teasley started the season on the CarrCraft Racing Suzuki Hayabusa, but lingering effects of a puppy love bite have baby brother spending more quality time with his lady that at the track. 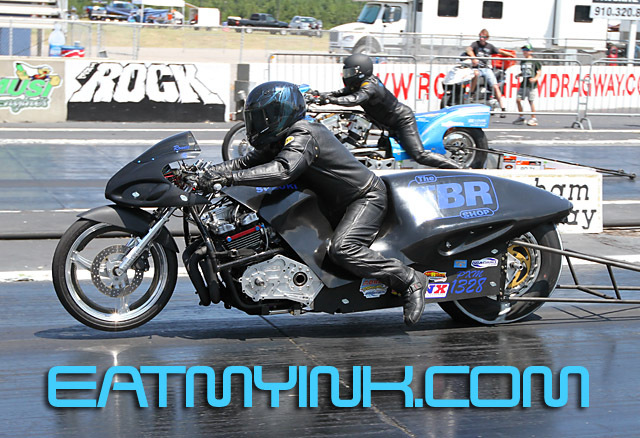 So dad James “Crow” Teasley Jr. took over the CarrCraft seat this weekend, scoring the Brock’s Performance Street ET win on Saturday before bent clutch steels sent the bike rocketing skyward and out of competition on Sunday. He beat frequent winner Jerry Turner in the final. 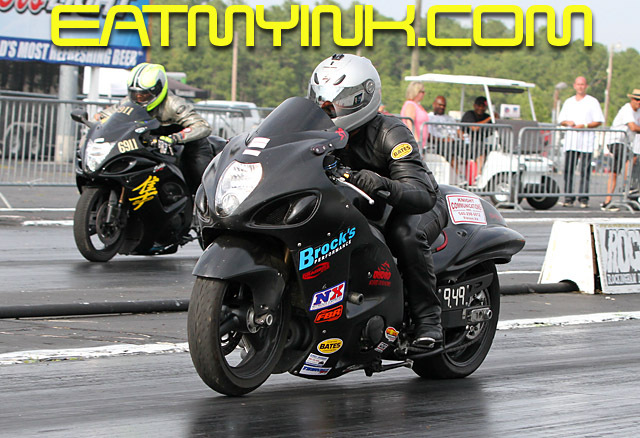 Barry Pryer Sr. won Brock’s Performance Street ET on Sunday, keeping fellow finalist Dustin Lee from doubling up. 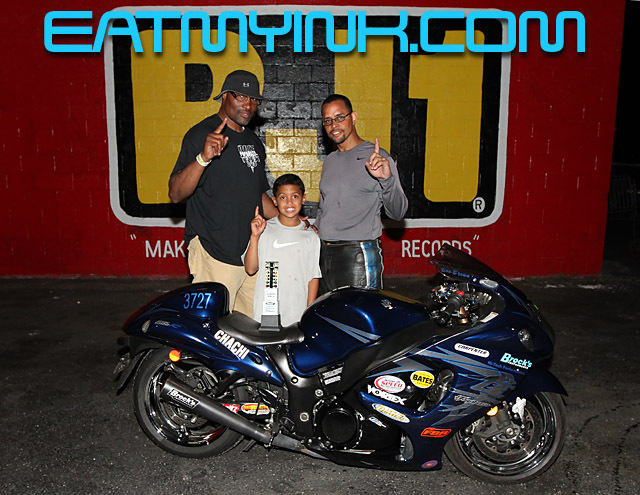 August race winner Lee and his ‘Busa streetbike took out Mark Schwalm and his Kawasaki dragbike in the Trac King/APE Top Sportsman final for that crown. 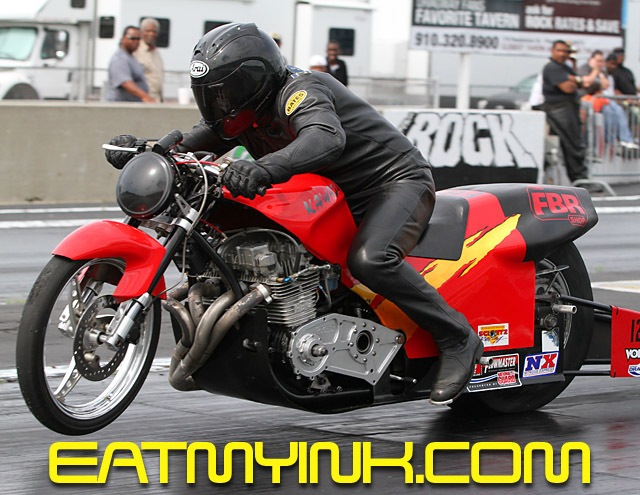 The season long Louis Concrete 4.60 battle between three-time winner Kenny Cornnell and Ronnie Smith continued at The Rock, with the world’s quickest eighth mile index bike class boiling down to these two in the final. Cornnell took the tree but Smith took the stripe for his second win of the season. 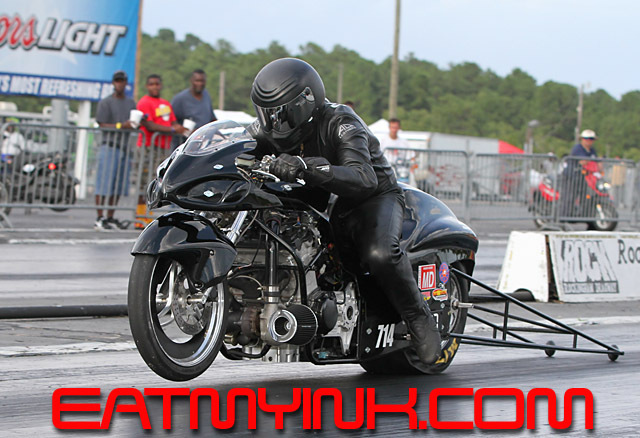 Sunday Street winner Pryer runner-upped to the fine looking turbo ‘Busa dragbike of Brian Canoles in Saturday’s Nitrous Express Pro ET final. “Formerly Big” Stanley Russell won Sunday’s final over Virginia racer Michael Rankin—both on no-bar bikes. Afterdark Underground was rained out, but grudge sessions saw some shakedowns going on, including Jeremy Teasley on the Adams Performance ‘Busa, and Ricky “Hollywood” Grayson and Super Dave Stewart on their Real Street bikes. 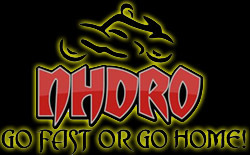 The Mickey Thompson MIRock Superbike Series races next September 6-8 at the historic U.S. Motorcycle Nationals at Atco Dragway in New Jersey. Forget what the flyer says, the Mickey Thompson MIRock Superbike Series Dragbikelive.com Sportsman Showdown at Rockingham Dragway is now a one day event following a popular vote at today’s rider’s meeting. 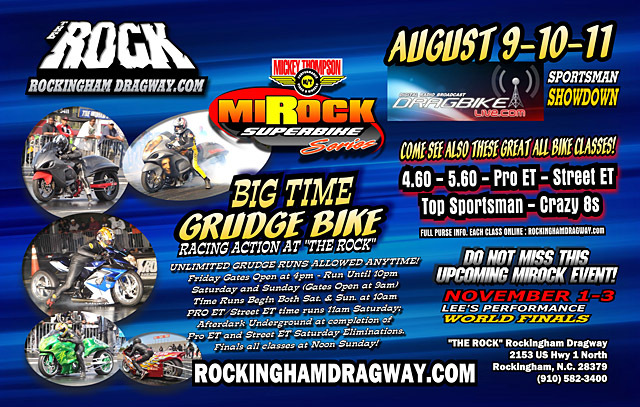 The Mickey Thompson MIRock Superbike Series returns to Steve Earwood’s Rockingham Dragway with the Dragbikelive.com Sportsman Showdown, and once again the spotlight will shine directly on sportsman and grudge racers. 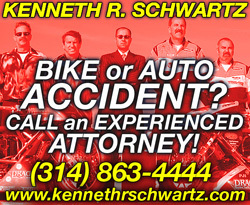 Three-time winner Kenny Cornell will lead the quickest index bikes on the planet to the eighth mile in Louis Concrete 4.60. Dialing it back a bit slower, FBR Shop 5.60 went to James “Crow” Teasley Jr. last time at The Rock, as Teasley was no doubt tired of seeing his famous son Jeremy claim all the glory. Class sponsor and points leader Marion Ford will not ease up, though, and aims to put his bike in the winners circle. Trac King/APE Top Sportsman is always the battle of the quickest and fittest, and Rockingham’s August heat will test the focus and tuning ability of these racers. MIRock Crazy 8s will see all-out, no-bar battles between class champion Shayne Proctor, Bob Carlson, Ben Knight and others. Typically stacked with talent, Nitrous Express Pro ET and Brock’s Performance Street ET fields will wage war for the dwindling spots remaining for November’s Fast by Gast Pro ET tournament of champions. And of course, what would The Rock be without lively Afterdark Underground and grudge sessions? The southeast’s finest grudge bikes and edgiest jockeys all call Rockingham Dragway home—the place for their longest, highest wheelstands and saltiest trash talking. You won’t want to miss it!